Since the Pew Internet Project began measuring adults’ online activities in the last decade, these two behaviors have consistently ranked as the most popular.1 Even as early as 2002, more than eight in ten online adults were using search engines, and more than nine in ten online adults were emailing. The table below shows how these two activities compare over time to some other popular online activities. Of course, the internet population has grown substantially since 2002. So, the overall number of users of both email and search engines has also grown. In January 2002, 52% of all Americans used search engines and that number grew to 72% in the most recent survey. In January 2002, 55% of all Americans said they used email and that number grew to 70% in the current survey. Email and search form the core of online communication and online information gathering, respectively. And they have done so for nearly a decade, even as new platforms, broadband and mobile devices continue to reshape the way Americans use the internet and web. Perhaps the most significant change over that time is that both activities have become more habitual. Today, roughly six in ten online adults engage in each of these activities on a typical day; in 2002, 49% of online adults used email each day, while just 29% used a search engine daily. The most recent search figures come from a survey conducted from April 26-May 22 among 2,277 adults ages 18 and over, including surveys in English and Spanish and on landline and cell phones. The margin of error for the sample is plus or minus 2 percentage points. The most recent email figures come from a survey conducted November 3-24, 2010 among 2,257 adults ages 18 and over, also conducted in both English and Spanish and using a dual-frame sample. The margin of error for the November survey is plus or minus 2 percentage points. Perhaps surprisingly for an online activity that has been around for a while, search is most popular among the youngest adult internet users (those age 18-29), 96% of whom use search engines to find information online. But even among the oldest internet users (age 65+), 87% are search engine users. 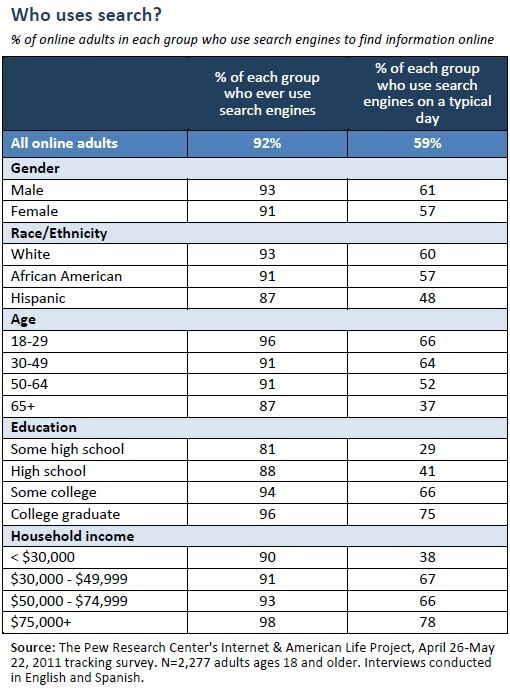 Adults who have attended college and the highest income adults make slightly more use of search engines to gather information online when compared with other adults, as the table below indicates. These same groups—young adults, the college-educated, and higher income adults—are also the most likely to use search engines daily. Similar demographic patterns existed in 2002, when Pew Internet first measured online search. At that time, the college-educated and the highest income adults were most likely to use search on an average day, though the overall percentage of online adults who used a search engine on an average day was much lower at just 29%. Two other patterns evident in 2002 have since vanished. Back then, men were more likely than women to say they had used an online search “yesterday” (33% v. 25%), and white adults were more likely than both African-American and Hispanic adults (31% v. 23% v. 19%, respectively) to report using a search engine “yesterday.” Today, there are no significant differences between these groups in these usage patterns. Email is similar to search (and many other online activities) in that the youngest online adults, the college-educated, and those in the highest income categories are more likely than others to engage in the activity. These demographic differences are considerably more pronounced when one looks at email use on a typical day. Moreover, while overall email use is comparable across white, African-American and Hispanic online adults, internet use on any given day is not. White online adults are significantly more likely than both African-American and Hispanic online adults to be email users on a typical day (63% v. 48% v. 53%, respectively). 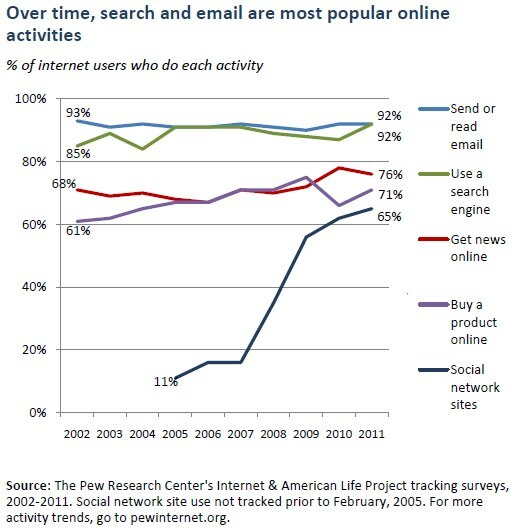 Email is also similar to search in that while some of these demographic differences were present in 2002, some were not. 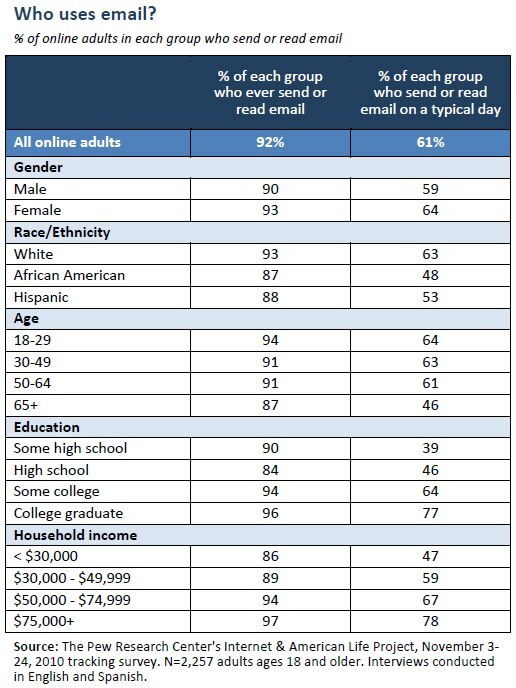 In 2002, college graduates were the most likely to use email, as were adults with household incomes of $75,000 or more. However, 2002 surveys also showed that overall, women were slightly more likely than men to ever use email, and white online adults were more likely than African-American online adults to ever use email. These two differences are no longer statistically significant.